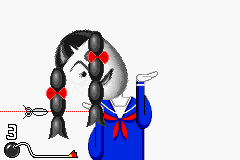 Home Haircut is one of Dribble and Spitz's microgames in WarioWare: Twisted! It returns in WarioWare Gold as one of Penny's microgames. 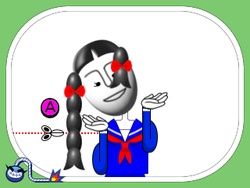 The purpose of the game is to cut the girl's hair braid off so that both sides are equally matched. 1st level difficulty: The hair braid is short. 2nd level difficulty: The hair braid is long. 3rd level difficulty: The hair braid is longer.